Over the last day or two, I have been thoroughly enjoying the BBC 2 series Volcano Watch. There have been some fantastic images, as well as links between volcanic activity and the wildlife associated with them. Over the last twenty years or so, I have had the great good fortune to be a leader of wildlife holidays and to lecture on cruise ships. This has taken me to many parts of the world and several have been in areas with considerable volcanic activity. 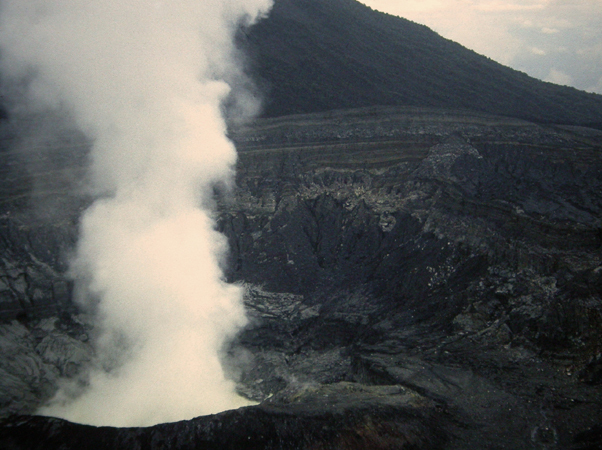 My first experience of a volcanically active part of the world was in Costa Rica in 1990. Our local guide told us that in 1964 when President Kennedy visited Costa Rica, the country gave him a twenty one gun salute. This was the violent eruption of Volcan Irazu, a mountain over ten thousand feet, which can be seen from the capital San José. The eruption was considerable, and the city was affected by a layer of ash. When I first visited Volcan Irazu in 1990, there was a whiff of bad eggs in the air, the crater which I was told at the time was the largest on earth was empty, and the cone sides contained masses of eroding ash. 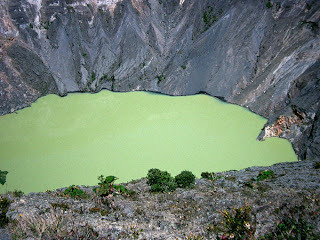 By 1994 and my second visit, it had filled with water, and had a sulphurous lake in the cone, and the water appeared to be boiling. One of the highlights of the day for my group was to have a look at cloud forest on the upper slopes of Volcan Irazu. Finding an open piece of woodland that would give a good opportunity to scan, I stopped the coach. The trees were stunted with considerable expanses of open grass between them. The terrain had a certain similarity with the New Forest, and I wondered what animals could be responsible for the grazing. Certainly, there was no evidence of large numbers of cattle or horses up in the mountains. 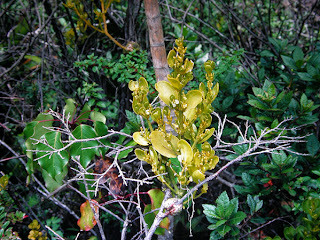 One stunted tree supported a mass of flowers in its upper branches, which were only about ten feet above the ground. I noticed these flowers had attracted a tiny, jewel like hummingbird. This was the Volcano Hummingbird in its Mount Irazu form, a species confined to a very few of the higher volcanic mountains of Costa Rica. 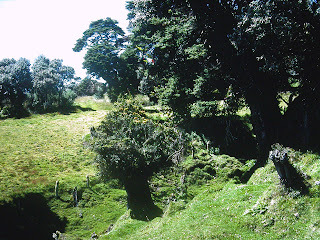 It turned out that this very unusual woodland had been created by a pyroclastic flow that had passed over the cloud forest, stunting it, killing most trees and creating a unique landscape and ecology. It was a day or two later that we visited another of Costa Rica’s volcanoes, namely Volcan Poaz. It was a misty day, and we could see little as we parked the minibus. The acrid smell in the atmosphere was very noticeable as we walked towards the recently active cone. It was between 1952 and 1954 that the volcano had had its last violent eruption, however the year before my visit, the Park had been closed to the public because of dangerous emissions of sulphurous gasses. We were lucky. As we approached the crater, the mist lifted and in front of us was a great column of steam. From time to time, we heard a crackling noise. 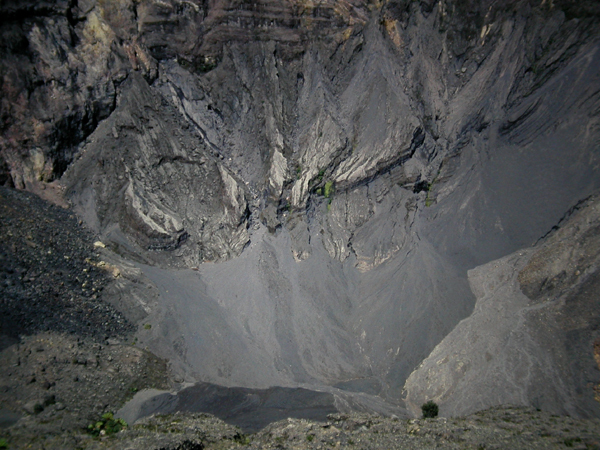 Our guide suggested that Volcan Poaz was still in a bad mood. As we stood watching the crater, a brilliant bird hopped onto a rock close by, and then dived towards the bottom of the crater. This seemed somehow suicidal. The bird was a spectacular metallic green with a bright orange belly. It was a Resplendent Quetzal and perhaps the most spectacular of all Costa Rica’s birds. One thing I did notice was that the rather stunted trees close to the crater were absolutely free of any lichens as if they were growing in a heavily industrial city. Evidently lichens find sulphur dioxide lethal even when the gas is released by natural events. Being a volcano, the upper slopes of Volcan Poaz support a number of endemic species confined to the immediate area. 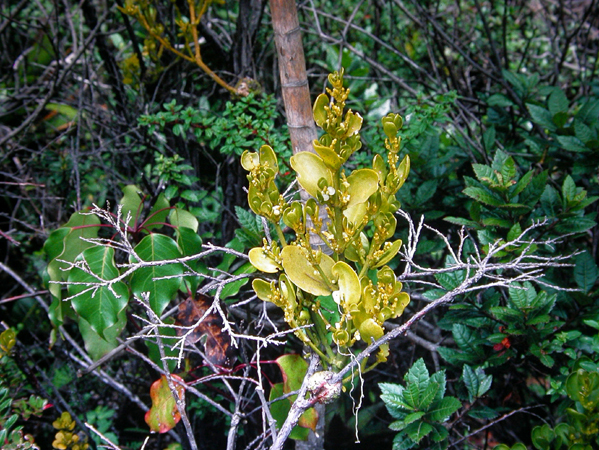 These include Bang’s Mountain Squirrel, as well as Magnolia poasana and an intriguing mistletoe Dendrophthora costaricensis ssp.poasensis. 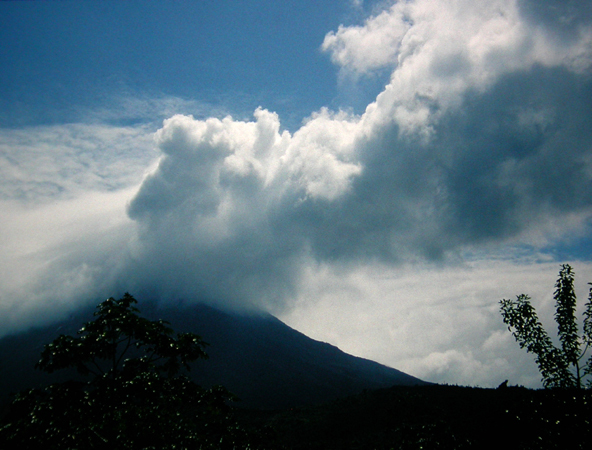 In those days, the most active Costa Rican volcano was Volcan Arenal, and I first visited it in 1994. At the time, it was possible to drive to a car park on the slopes of the volcano. The car park was later closed, the reason we were told was that a visitor had decided he wanted to explore the volcano even closer. It was not until the soles of his shoes had burnt through that he was made aware of his deadly mistake. We arrived at this car park in the middle of the evening; it was quite dark. Although a plume could be made out above our heads, it was cloudy and the spectacular firework display we had been promised was not forthcoming. We stood beside our minibus looking towards the volcano for perhaps twenty minutes or so, before there was a mighty roar, a rumble that seemed to have come from the throats of the gods deep in the earth. Moments later, the pit-pitter-pat noise of particles hitting the car park asphalt got us back into the minibus at break neck speed. Although we spent some time in the hope of a fiery spectacle, the cloud was too thick and at around midnight, we gave up. 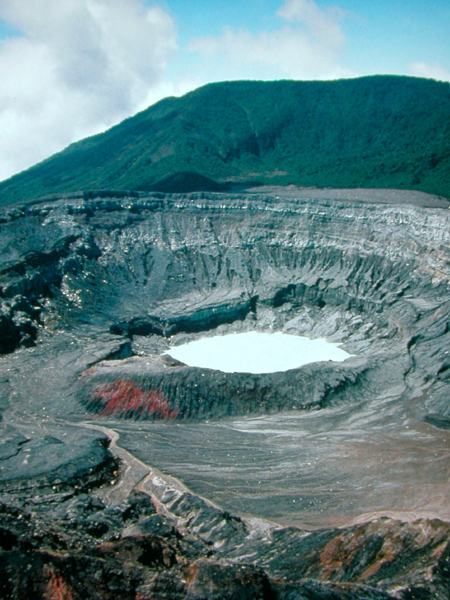 I have now visited Volcan Arenal on five occasions, and all before October 2010 when activity ceased, and the volcano became ‘dormant’. On the fifth occasion, having been promised a firework display by our local guide, I voiced my scepticism. “Ah, you have been before,” He said. “Yes I have,” I replied. Evidently, the chances of clear skies, and a spectacular show except during certain seasons is very slight. The best I ever saw, and this with considerable imagination was a boulder rolling down the upper cone, which appeared to be glowing. However, my experiences of Volcan Poaz were none-the-less spectacular. 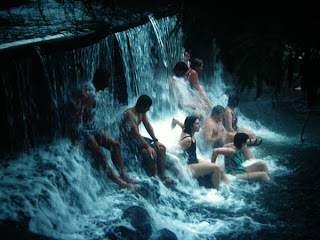 At a hotel in the nearby village, it is possible to sit beneath a pleasantly hot waterfall, and to swim in a swimming pool at the temperature of a hot bath. Entering the pool is done slowly because of the heat. As I swam, I was serenaded by distant howler monkeys, which added to the exotic atmosphere. Passing a steaming stream, we were warned that bathing in the open countryside was not advisable as Costa Rica’s extensive poisonous snake fauna also enjoy the warmth from the volcano. On one occasion when I visited Arenal, the volcano was surrounded by blue sky, and it was only the top of the cone that was shrouded in mystery. On this occasion, a grey billowing cloud rose above the surrounding white. The noise of the eruption was sepulchral, and it seemed as though the gods began breathing as the molten lava lake rose and fell following the discharge of material into the air.